making: ROBYN'S FETISH CHALLENGE #239 "USE A DIGI"
ROBYN'S FETISH CHALLENGE #239 "USE A DIGI"
ROBYN'S FETISH CHALLENGE #238 "THINGS WITH WINGS"
ROBYN'S FETISH CHALLENGE #236 "THANKSGIVING"
Good Morning on this cold and icy Sunday. It's not a great thing to wake up and there is ice on the steps and sidewalks. When I let my dog out she was having a hard time standing on the stoop that she fell down to the first step. Yes, I laughed at her but she did get back up. She went straight into the house. This is something that I probably won't ever see again. With everything I have been going through I needed that little laugh. Thank goodness for my pets. They always amuse me. Now that you seen that wonderful prize for this week's challenge. Here is my card that I made. Another one that I'm sending out. I hope you can see how well the paper went with the ornament. I had the holly that I really liked when I put it on the card. It just was a great added touch. I hope you think that it turned out great. 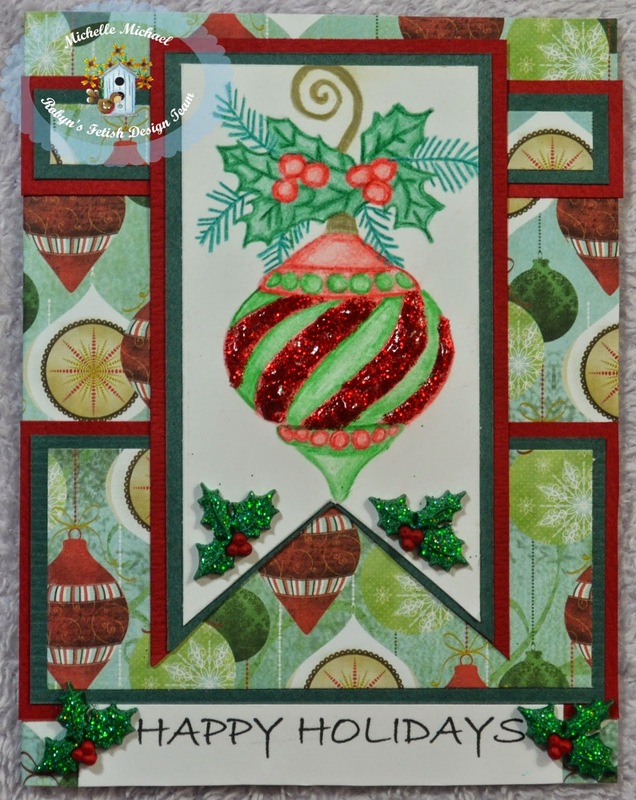 Here are the items that I used to make this Christmas card. You can find more great cards from our designers at The Robyn's Fetish Challenge Blog. There are many great ideas there and that's where you will find the linky to add your card for this week's challenge. Hope you have a great Sunday and a Wonderful Week!!! I will see you next Sunday and Happy Thanksgiving to you all.